There are 2 cat videos tagged with petting. No one knows which of these two camera hams is sweeter. Whether it's the pig being petted by the cat like a human would pet. 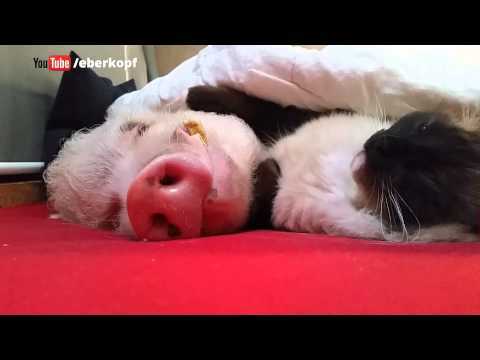 Or the fact that the cat itself is laying there, purring and cuddling with the pig and petting him in turn. One thing for certain is it's just adorable all around. At 33 seconds, it's short enough not to over stay it's welcome, but long enough to make most everyone squeal in delight when watching it. The only thing that would have been even better? If the cat gave the pig a sweet kiss on the cheek before hugging it even more. This lucky guy has a cat visit him every day at work. They eat lunch together, the cat takes a nap, there is a quick petting session, and they part ways until the next day. How cute is that? If only we could all be so lucky at work.